Can you believe our family had five day weekend due to snow? Last week on Thursday was an early release and today is a two-hour delay. Six family members snowed in for five days could have led to intense stress if I allowed it. 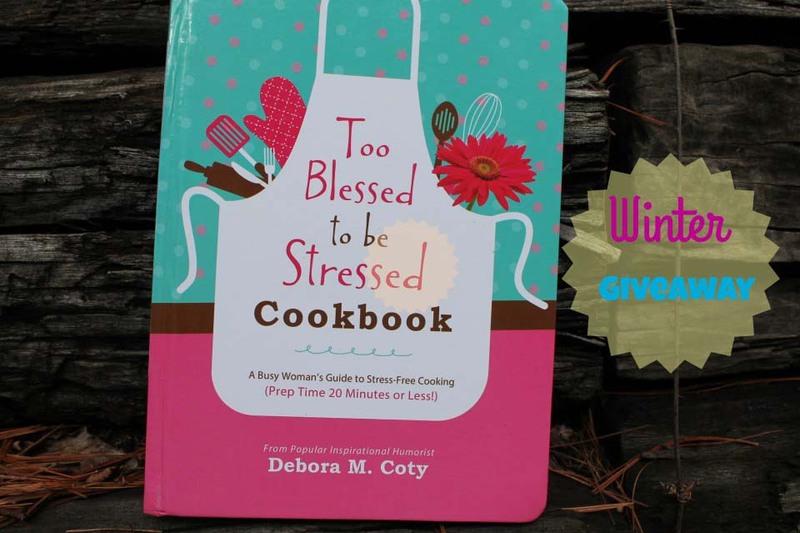 Just before my birthday in the New Year, I received the Too Blessed to Be Stressed cookbook written by Debora M. Coty. The title says it all and speaks to me every time I pass by it on my cookbook holder. It’s the perfect companion and color for my newly remodeled kitchen and so cleverly written. Whenever I pass by the cookbook, it reminds me I am so blessed, even in the midst of snow days with four kiddos and two school teachers, a cluttered house, wet clothing, muddy tracks, firewood debris and heaps of laundry. Three meals a day, dishes galore, a foot of snow, more wet clothing; need I say more? I’ll just repeat, “I’m too blessed to be stressed.” There are over 100 fantastic time wise, soul fed, company happy and heart healthy recipes. From dump dishes, quick fix, slow cooker, breads, munchies, sweet tooth and more, they all appeal to me. Debora has blended inspirational thoughts and humor with lip-smacking photos and simple ingredients in an easy to follow layout. It makes me hungry sharing all about it. I was especially fond of the slow cooker creamy potatoes Au gratin recipe made with simple staple ingredients. Speaking of staples, the staple list in the back is such a helpful list to a newlywed, college student, new mom or super busy person like myself. The cookbook reminds me of my first cookbook out of college with 5 ingredients or less. I can see why the ingredient list appeals to a potential stressful person who is constantly busy. I’m not thinking of myself here. I’ve only got four kiddos to get to school before 8:30 am, teach three foods classes a day, plan, shop and purchase groceries for school and home, cook dinner in a jiffy, squeeze in a 2 mile run before helping with homework, signing folders and retire by studying for National Board Certification. Yes, I get stressed and yes, I’m blessed. Recipes like the ones in this cookbook can save my day. This week I have fresh brocco-flower salad on my menu.Because I overflow with blessings, I want to share one with you. I have the opportunity to give away one of these delightful cookbooks to one of my readers. Please comment below by sharing one or more of your blessings. Or share this giveaway on Facebook, Pinterest or Twitter for extra entries. Just click on the icons on the homepage. Be sure to comment telling me which social media you shared this giveaway and I’ll randomly choose from all of the comments/entries below. Good luck. I look forward to sharing your name and address with Wynn-Wynn Media who will mail your awesome package to you. This cookbook was provided for me for review by Wynn-Wynn Media, LLC. All the opinions are my own, especially the ones about my 5-day snow break. Please check back to see who the winner is on Saturday after midnight central time when this giveaway opportunity will end. The winner will be notified via email and asked for his/her mailing address. Thank you for participating. This entry was posted in Giveaway on 27.01.2016 by admin. Thanks so much for the terrific review, Jackie! Hey, for the Fresh Brocco-flower, buy the cauliflower and broccoli already cut into florets to save even more time and energy – they come in a package together in the grocery produce section. You’re gonna LOVE this stuff! My fam can’t get enough of it! Your posts are such a blessing to me. I share your name and Mom on a Misson with my family and friends. Some of them have become your followers. The freezer ideas are priceless, especially for those ladies who work outside the home and have children still at home. Thank you for all that you share with us. This is a great website. Mom on a Mission is a working mom, wife, and mother of 4, who plans freezer meals for her family to save money and avoid having her family eat the processed and fast foods that are so unhealthy for all of us. Check out her website. I am blessed to have a job that I really enjoy! However, between my commute and work hours, I am away from home for 10 hours a day so this cookbook sounds like my kind of recipes! Thank you! My blessing is that this big snow storm just missed our area last week! Even though I love snow, I don’t like being snowed in for long periods of time. I do love to cook and I would love to win so that I can try out some of the great recipes too! I shared this giveaway on my Pinterest account! My children and grandson are a wonderful blessing in my life. I agree that your website is a blessing. I also feel really blessed by the guys that are helping my husband and I build our new house. I often get super stressed with the homebuilding process and need a reminder that my blessings outweigh the stresses. I would really like to win this cookbook. I enjoy your recipes and newsletter. The Taco Soup recipe showing on the cookbook page looks wonderful and delicious. I enjoy reading cookbooks like other people enjoy reading novels. It would be in good hands if I won it and I would be delighted to let everyone know that it was a good one! My kiddos and husband are a blessing to me….thankful for them! I am so blessed to have my husband and three kids. They are my greatest joy. Thanks for the chance to enter. My greatest blessing is my son. After years of infertility, we finally adopted our baby boy. He is now an energetic 6 year old who just started Kindergarten this school year. We prayed so hard for this blessing, he is our miracle! I am thankful that my new house is dried in. Building a house is stressful, but my blessings still outweigh the stresses. My greatest blessing is my family. From my husband who helps out with the housework when I work 60+ hour weeks, to my 10 year old who is smart and sassy and loves all animals, to my 7 year old who is food obsessed and is funny, smart and loves God deeply.